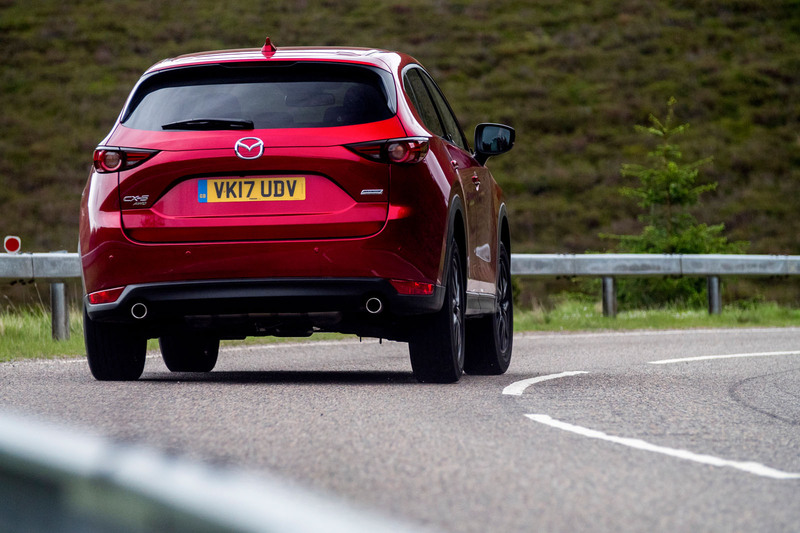 The Mazda CX-5, new and improved, and driven in the UK for the first time. Styling, refinement and stiffness gains are the notable bullet points in a comprehensive, if somewhat shallow, update to Mazda’s well-proportioned crossover. Those proportions are given top billing by a design makeover intended to simplify and sharpen the model’s appearance. The result, neatly poised on the wide-mouthed grille and glowering headlights, makes the CX-5 marginally larger than it was previously – but infinitely sleeker, too. The obliging sense of tautness continues beneath the skin. Thanks to detailed revisions made to the car’s construction, Mazda claims a 15% improvement in torsional rigidity – a dynamic enhancement supplemented by a revised chassis and the introduction of a new torque vectoring system. Track widths have been slightly broadened as well, and the car is 35mm lower than its predecessor. The platform, though (and therefore wheelbase) are the same, as is the engine line-up, which centres on Mazda’s robust 2.2-litre diesel unit. We're sampling this here in its more powerful 173bhp format, which includes adaptive four-wheel drive and a six-speed manual gearbox as standard. Much like outside, the CX-5’s interior enjoys a useful bump in appearance. Architecturally, the hardpoints are generally the same, although the isolation of the now free-standing infotainment screen and the elevation of the centre console – not to mention a rethink of the trim materials – has gently elevated perceived quality. As well as assuaging your eyes and fingertips, Mazda has also devoted significant time and energy – and reportedly extra weight, too – to appeasing the ears. The list of modifications made in pursuit of a quieter ambience is long; long enough, in fact, to suggest that the upshot ought to have been more impressive than it is – the CX-5 is doubtless better isolated than its predecessor, but probably still not in the latest Volkswagen Tiguan’s league. It is that not-much-more expensive rival, one suspects, that the manufacturer is keen to close the objective gap on. Certainly in some respects, not least in the way it drives, Mazda has taken noticeable strides. 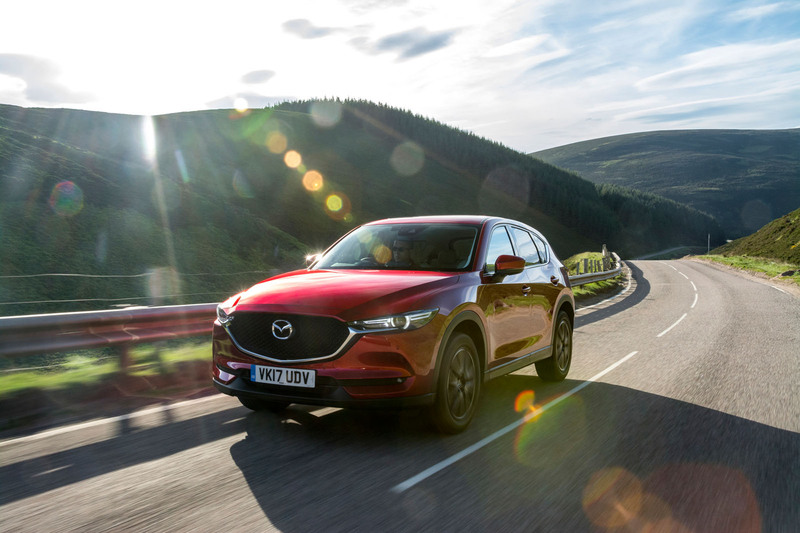 The CX-5 – never less than competent – has benefitted from its more rigorous spine: roll and pitch are kept scrupulously in check, and save for a slightly indifferent steering response, the car changes direction about as well as you could hope from a mainstream crossover. Added by the mostly indiscernible shuffling of power to the back axle, lateral grip (even in miserable Scottish weather) proved commendable, and a wholly satisfying match for the 310lb ft of torque delivered by the four-cylinder engine (bewilderingly superior to the 280lb ft of the bigger-selling detuned version). Lingering doubts about firmness of the low-speed ride remain, especially in the front-wheel-drive model, but this four-wheel-drive model's amiable relish for fast A-roads was as conspicuous as it was laudable. There’s no functional reason why not. 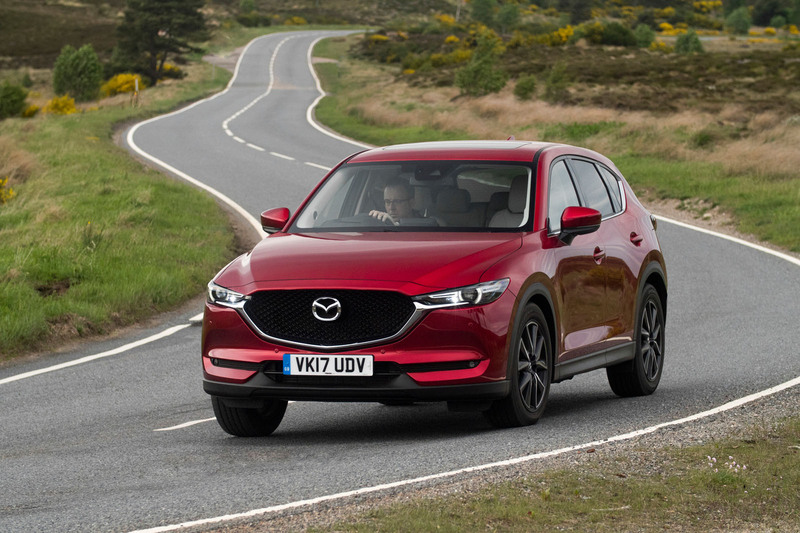 The notable absence of any alteration in the engine bay aside, the CX-5’s renewal is a creditable one – rendering not only a manifestly better-looking car inside and out, but also one that drives with sufficient proficiency to make experience if not entertaining, then at the very least agreeable. It’s also as decently sized and as practical as ever. The pragmatic rub, as it often is with Mazda, is located less in the car than on the price its maker puts in the brochure. At £31,395, this all-wheel-drive Sport Nav model – the one you really want – is only around £1000 cheaper than the 187bhp 2.0-litre TDI 4Motion SE Tiguan, which comes complete with a DSG automatic gearbox. And while the qualitative daylight between the two cars has dwindled, enough of it remains for the new CX-5 to land high among the respectable also-rans rather than on par with the class-leader. Massively more appealing than a Tiguan in my view - and I would bet that more generous equipment levels would close that price gap. If I lived in Northern Scotland I'd be very tempted by this. .. the Auto version effectively works out at £2,800 more than the article's Example Tiguan which is an all new model. Wonder if VW are deliberately keeping their prices low at the moment following Dieselgate? Far more appealing than the dreary Tiguan. I don't agree that the Tiguan is dull-looking. I worry about the direction car aesthetics is heading, where restrained or un-ornamented equates to dull, and flash, as epitomised by MB and increasingly shared by BMW and JLR, is interpreted as quality. The Mazda is not flash and is quite pleasing, but the VW is still a smart looking car. I nearly forgot the Tiguan is German. CX-5 is way better looking IMO, not the normal VW SLAB, Price wise....at least compare similar specs before you start the usual praise of the VW product!!!!! 3 options of leather, LED headlamps, keyless, already you've spent £3500+ and no doubt you would add more......Remember all these are giving more money to VW to compensate USA customers and dealer networks, here in the UK we get nothing apart from supposedly a poor fix, leading to component failure and increased fuel consumption?? Too much company car tax. ... the other day in the car park of a Premier Inn just outside Banbury, early, lined up among a load of Tiguan's ... I wonder why? Anyway, it's a very mature yet emotional and shapely design, almost beautiful for an SUV. The design is much better resolved than the current car, which is not exactly bad. Surprised by the review and can't agree with the final "among the respectable also rans" comment . My wife bought the Mazda 175 AWD in manual form at the weekend when attending the new model launch at the local dealer, having booked a test-drive. She'd previously been pretty much dead-set on a Tiguan R-Line 4-motion, again with a useable stick and wasn't too keen on trying the CX. Looks wise, there was only one winner. Mazda all the way. It looks stunning. The CX-5 cabin was also a more pleasant place to be with quality leather, some lovely modern design and a very nice soft-touch finish. Not especially sold on the top-mounted Nav and Infotainment system to start with but after five minutes using the rotary commander and hot-buttons it became second nature. VW internally was certainly nice, very well put together and extremely functional but quite stark in that typically Germanic way and it didn't 'wow' us as the Mazda did. And then we got to the 'pounds and pence' and the Mazda blew the VW in to touch. A smidge over £34k fully spec'd with safety pack and some accessories plus a little discount versus £39k for the equivalent similar-spec'd and optioned, (incl. leather) manual VW, (ok in top spec AWD R-Line rather than SE form), with some dealer discount. (Tried Carwow as well)! Was a no-brainer and we signed on the dotted line. Yes, residuals might be factor but we tend to keep this type of car for between 3 and 5 years and felt that the Mazda would better suit our needs.